7 mile race on ‘Trail of Tears’ trail. It was supposed to rain a bit today morning but the weather appeared just fine. Diane was right on time, 6:00 am at my apartment. We met John and Keith on the way by Target. Subha was on her way but later decided to meet us at I-24. John and Keith hopped into Diane’s car and we headed straight to “Tears of Trail”. The weather was around 36, but it wasn’t snowing or raining though. We could see lot of waterfalls on the way which looked like it was raining somewhere. We started talking about the number of marathons and ultras each of us have run. What to say about John and Keith, two awesome people. Great runners. Keith has been running and winning a lot of races and scoring lots of points. John has run 20 some marathon and ultras. I could just sit and listen to their stories all day. We had some insightful conversation about lot of things. I was amazed at how knowledgeable and yet humble John and Keith were. I’ve got a lot to learn from all of them. Took a couple of stops at rest area and also caught Subha on our way. After about three hours of drive we reached the race spot. There was lot of runners already running around, stretching and warming up. While the others went to pick up their T-Shirt, I was roaming around looking at the ‘Trail of Tears’ visitor center (The history behind the name was very painful). After getting out of the visitor center I stepped out to warm-up and there were lots of folks giving weird looks at my VFF. I don’t blame them though. I was acting like I was the ambassador for VFF explaining about the shoe. Just hoping that it doesn’t hurt during the race. 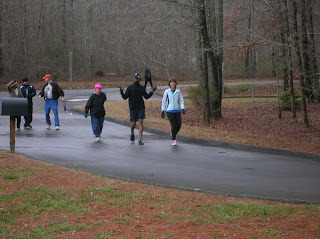 While everyone took off at the start line I decided to run slow along with Subha and Harish. Mile 1 was rough. A steep climb with an elevation change of 800m-1100mts. We pretty much walked until 1.5 miles. After a while, I went ahead with the race. The weather was kinda cold with occasional snowflakes but otherwise it was fine. Picked up a bit of pace at mile 3. I was literally sweating by this time and the occasional chill wind was feeling Heaven! My VFF was feeling great too. I could see an evident change in my posture. Since it had no thick soles, it was making loud noise while running on asphalt which got the attention of other runners but it felt great though. Crossed the finish line at 1:05:48 and as usual I didn’t reset my Garmin! Didn’t feel any pain or shin splint which is a good thing. We were so glad when Subha and Harish crossed the finish line. They both finished their first race. Yay! Hogged some hot dogs, Oreos, oranges, apple and finally some soda. It’s bad stuff, I know. When you are in the company of great folks, time just flies by and in no time we reached Nashville. My first Tennessee State Park running tour was really good. Time for a hot shower and a pool game tonight! w00t!